As anyone who lives, works, or spends any time with teenagers knows, adolescence can be both the best of times and the worst of times. Teenagers are undergoing miraculous, world-altering shifts. In light of these changes, how can society help adolescents move safely from teen to adult? How can adults and adolescents engage with each other in ways that are positive and mutually beneficial to one another's journeys? 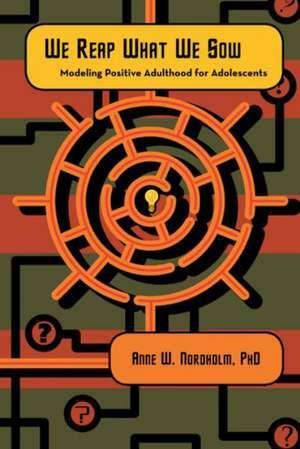 In "We Reap What We Sow," author Dr. Anne W. Nordholm blends philosophical and educational approaches to demonstrate how you can cocreate an abundant future and help you guide a young person toward an engaging and meaningful adult life. She first describes what it means to know ourselves and the difference that knowledge can make. She then offers strategies that, when modeled by adults, adolescents absorb not from what we say but how we behave. Every person must figure out a life that is individual, is connected to a community, and has a particular historical context. This guide explores how we know and connect to our communities and how historical consciousness assists us in finding and creating meaningful work. It also considers how we can be better guides to the next generation via skilled and disciplined communication and reconsiders the institutions we've established for adolescent learning to better reflect what we understand as effective adult maturation.